Can you date this stove? Looks like an old Primus stove but it's been a while since I saw one. Looks European to me like Bluet Gaz from maybe the 1970s. The local Boy scout council had one back in the mid 80's. I never saw it in use but remembered it from gear check outs. A link to a thread about them on classic camping stoves. Not really Tipi. The Snow Peak bipod is the same thing with a modern canister. That's really cool looking. Thanks for sharing Pat, and Jason for the knowledge (I spent a good couple minutes reading about these stoves that I had never heard of). 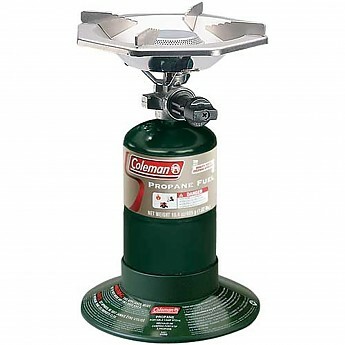 One significant difference between the Coleman that Tipi shows and the Primus "Grasshopper" that Jason shows is that the Primus is butane and the Coleman is propane. 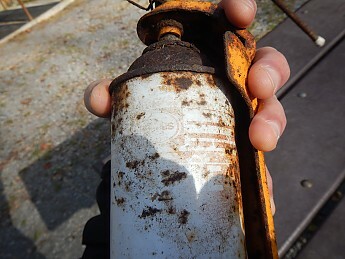 The Propane canister is much higher pressure than the Butane. The burner designs are also different. Bleuet was a French company that was bought by Coleman. 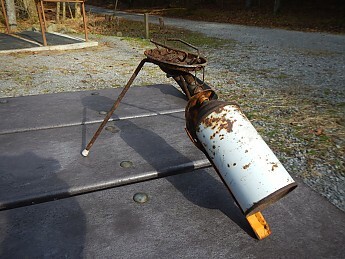 I still have a few of the Bleuet "punch" canisters and several of the stoves from when my Scout Troop decided to stop using them (a huge disadvantage with the "punch" type stoves is that once you attach the "punch" canister, you have to completely burn off the butane before you can remove the canister from the stove). 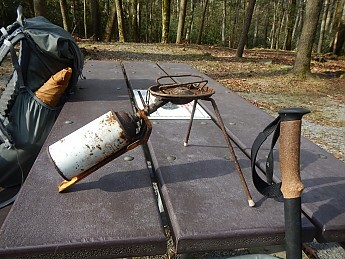 Bleuet (aka "Camping Gaz") had a wide variety of stoves and lanterns, including screw-on with a gasket that you could remove a partial canister if you were very careful. I have several of that type stove and lanterns. A year or 2 back, someone posted a question about where to buy the canisters. There are a few sources that have SE Asian copies of the Bleuet canisters, one of which advertises occasionally on eBay. There are some complications about shipping the canisters though. 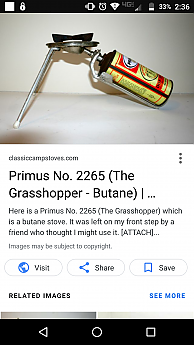 Primus made this in two styles, one was propane (Grasshopper) and one was butane (Ranger). I don't know how long they made these, but the Backpacker review was from 1978. I have several of the camping gaz canisters. Free to anyone locally in Dallas. Re: OP questions — At any rate, someone from somewhere also “went off trail on the north side of Thunderhead Mountain” some time ago. Was there any other debris? I have 3 of these GRASSHOPPERS in my basement and used them a lot in the 80's while backpacking in Panama and Hawaii. Boiled water for "just add water" meals. Worked very well. I had one at one time and i'm tempted to go dig in the attic to see if I still have it. I had drilled a bunch of holes in the leg along the tank to save weight. Nice memory, thanks for posting the picture! funny to see these old stoves, we used to sell stoves as well, now these models are outdated and "antique". Just want to say to Patman: Good job, throwing it away, keep the tracks clean. Thanks to all for the information, I knew this crew would know! 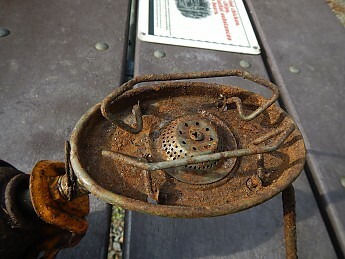 It is an old stove of what was called the Grasshopper design. 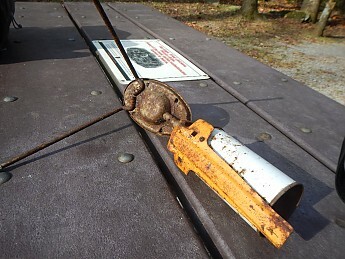 A similar design was mostly for car camping and used those old heavy steel canisters that can still be bought for car stoves and lanterns. They were still being made in the '80s and for all I know, perhaps still are. I note that yours looks like it took/takes the somewhat newer Primus-style canisters which are less heavy. I have an old Hank Roberts stove that will soon hit the Goodwill that takes similar canisters, lighter than the old steel models. They too went the way of all things when the new, ultra light stoves came out that handle the lighter iso-butane mixtures. I never had a Hank Roberts but always wanted one back in the day...Colin Fletcher's recommendation went a long way with me but I got distracted by newer models. Some years ago I bought an adapter which allows a Hank Roberts stove to run on modern fuel cannisters. I don't recall where I found the adapter. Works well and it's a great way to keep the classic stove running. 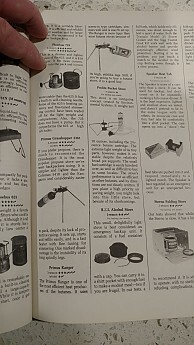 I'm surprised I remembered what an old Primus stove looked like when Patman posted this...my first instinct was to reply with "You can but the dinner conversation is pretty much one sided." 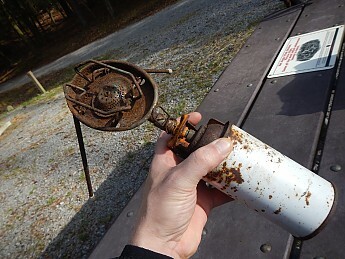 That is an old Grasshopper stove. I used one once in 1969 (or maybe it was '70). It used the propane bottle as the third leg. It was very heavy (due to the propane bottle). The idea of the bottle as a third leg LOOKED like a good idea originally, but when I used it the San Gabriel Mountains (very dry conditions), the pressure on the propane's attachment was so great I got a flamethrower at that joint. The flame was so hot that I could not put it our, and tossed it into the nearby stream to avoid a forest fire! I retrieved the remains, and that was the last time I or any of my friends tried to use that kind of stove. This forum: Older: Backcountry Camping Near Phoenix / Sedona Newer: Shout out to TS members for excellent advice! Topic: Can you date this stove?